Positive Thoughts, Positive Life! was written by T.E. Corner. T.E. Corner is more than an author, he’s a father, a national accounts relationship manager, public speaker and more. His latest book, Positive Thoughts, Positive Life! is all about focusing on the good in your life and accomplishing your dreams. The book focuses on Kylie, a little girl we watch grow up living life to the fullest. When we first meet Kylie she’s a young girl playing with her best friend. They are having a blast doing the typical kid things like swinging and playing at the park. Throughout the story Kylie grows up and we see how she handles her everyday thoughts. She always keeps it positive! When she is younger and has to say good bye to her friend she looks at the bright side even though she is very sad. Kylie focuses on seeing her friend again and all the fun they will have again when they get together. When she’s a little older and playing tennis she focuses on all the fun she’ll have at the tennis match. She understands they will not win every game and she’s ok with that. Kylie focuses on all the fun they will have playing the game. Throughout Kylie’s life we see her focuses on the good side of events and focus on the happy moments to come. Even when something may make her sad she does not dwell. And Kylie is aware that because she focuses on the good and positive that her life has an upbeat feel. Good things happen because she focuses on the good. T.E. Corner’s goal is to help each child learn that if you focus on the positive aspect of life you can have a happy life. I really appreciated the work pages in the back of the book. There’s a place for your child to practice writing down their own affirmations or positive thoughts. 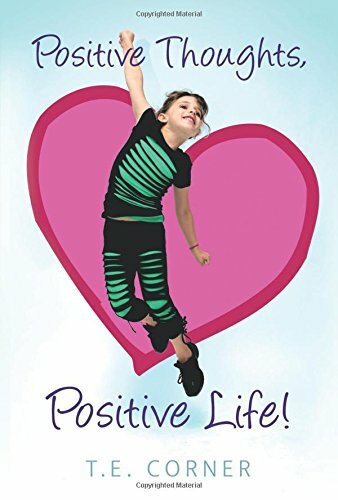 You can order your own copy of Positive Thoughts, Positive Life! on Amazon. What a great book! I definitely struggle with negative thoughts, but as I’ve grown more aware of them I am beginning to change. I can feel the physical effects of negativity and it’s awful! Will have to add this book to my reading list.